Ever since I have known him (he was 36 when we met and is about to turn 77), he has gotten particularly grumpy around his birthday. I have only gotten depressed once over a birthday and that was when I turned 40. Now I look back and realize just how silly that was! I would give anything to be 40 again!!! The way I see it now is that each birthday is a gift, and I appreciate them more than I can express. So on Tuesday of this week I went for ct and pet scans. I hate the two day wait to get the results! Every minute is agonizing. I can make up crap in my head that is much worse than the results! “Then why did you ask me?” I responded with a smile. I adore this doctor! He is so perfect for my personality it is scary! He is blunt, irreverent and now feels comfortable enough to cuss in front of us. I feel right at home! He read me what she wrote. She didn’t want to do surgery. She thought the tumors were too small to find and that I should be treated with more chemotherapy. Sir C and I laughed. Then Sir C tried to ask a question but Dr. Lenz, who was sitting next to him, put his hand on Sir C’s wrist and shhhed him. We smiled. At that he burst out of the room and disappeared for five or so minutes. It seemed like an eternity. My normal blood pressure is about 112 over 65. When I am waiting for scan results it jumps to 170 over 100!!!!! CRAZY SCARY! He finally came back in the room. “It is mixed.” He said he said softly. What the F#@& does that mean???? I thought. OK, here it comes, I am full of cancer and I am dead meat. Now how will I finish Pankies’ MACH??? Dr. Lenz saw the horror on my face. “NO! NO! It is not BAD!” He shook his head at me and waived his expressive arms and continued. I tried to process. Wondering why one would be dramatically melting away while the other one grew. Then I thought about how the surgeons all said that the masses would be very difficult to find so maybe growing wasn’t all that bad. 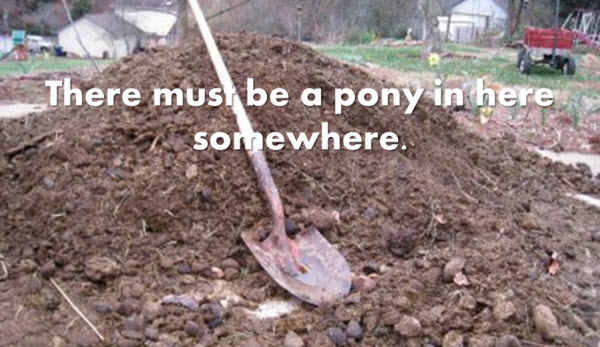 I had to find the pony in the manure! We discussed the chemo side effects. I told him that my hair is falling our much more so than the last time. He said that the new chemo I am on causes more hair loss. I told him that pretty soon I would look like him! He got a very offended look on his face, pointed at his thinning flat top, looked over at Sir C and said, “CAN YOU BELIEVE ZISS??? ?” We all laughed. I do look like the moths have gotten to me. So surgery is scheduled for January 29th at Keck Hospital at USC in LA. I hope they find those two ponies in all that manure they have to dig through! The BEST news is no chemo for NINE FREAKING WEEKS!!! “Well,” I responded, “agility IS my life!” I looked over at Sir C and we smiled. “HEY! I did a four day trial last weekend only two weeks out of chemo and I did FIVE runs on Thursday, Friday and Saturday and SIX runs on SUNDAY!” Dr. Lenz threw up his hands, shook his head, smiled and left the room. Meanwhile, I continue on my journey of wellness and good eating and juicing. Still no oil, no sweeteners, vegan and unprocessed. I will be praying for you, Helen. Helen I know in my heart you are going to be fine . Brave, brave are the parent’s of Pankie…Your Dr. sounds fantastic, and so far he continues to smile while he keeps you as healthy as possible. HE has my admiration, right behind you and MEl, and all the friends who hold you up. I am praying that this New Year be the very best for you .! !We need you to stay strong and happy so you can continue sharing the absurd with us ! Good, and bad. At least no chemo. I hope they find the ponies in there! Not knowing results is the worst, even if the news is bad, at least you know. Then you can make a plan. I’m sure Dr Lenz loves working with you. Not everybody has a sense of humor about CA. It sure helps though. All my love. Great news! You are on the right track!! And your dietary changes are an inspiration, not to mention your agility accomplishments! I am with you on the birthdays. I never thought I would live beyond my 20s but I am about to turn 63. My habit is to declare the entire month of January as my birthday holiday. I always look for ponies. I think you have a pony in your doctor. I would give anything to find one like him.